Aims: To investigate a population of individuals with 22q11 deletion syndrome for hypocalcaemia. Methods: A detailed clinical history enquiring into symptoms of hypocalcaemia and blood sampling to assess for hypocalcaemia and hypoparathyroidism, of patients outside the neonatal period known to have the 22q11 microdeletion from fluorescent in situ hybridisation studies was taken. Results: Sixty one individuals were identified, of whom 23 were untraceable and one was unable to give informed consent. Biochemical investigations were performed on 27 subjects. Ten subjects had review of notes only. Four subjects had previously identified hypoparathyroidism. A new case of hypoparathyroidism was identified. Three subjects had borderline hypocalcaemia. Discussion: In this population of patients with 22q11 deletion syndrome, 13% of the total or 30% of those biochemically assessed had evidence of reduced serum calcium concentrations. It is likely that 13–30% of patients with 22q11 deletion syndrome have possible hypoparathyroidism outside the neonatal period. Reported symptoms of hypocalcaemia did not correlate with biochemical evidence of persisting hypocalcaemia. We have shown that previously undiagnosed asymptomatic hypoparathyroidism occurs in patients with 22q11 deletion syndrome and conclude that screening of this population should be considered. Hypoparathyroidism is classically a transient feature in the neonatal period and more a characteristic of the DiGeorge syndrome subgroup of 22q11 deletion syndrome. Ryan and colleagues5 reported hypocalcaemia in 60% of subjects with 22q11 deletion syndrome, mostly in the neonatal period, but some in childhood; one patient was diagnosed aged 18 years. The natural history of hypocalcaemia remains poorly understood or defined. It has been shown to be both latent6 and overt7 in children and adolescents with 22q11 deletion syndrome. Adachi and colleagues,8 in reviewing their population of patients with hypoparathyroidism, found 10 of 14 children to have 22q11 microdeletion with an age of diagnosis of hypoparathyroidism between 9 days and 13 years. The population of individuals with 22q11 deletion syndrome are cared for by many different specialists because of their variable phenotype. We hypothesised that in a population of patients in South Wales with known 22q11 deletion syndrome, it was probable that some may have undiagnosed hypoparathyroidism. The complications of chronic hypocalcaemia due to hypoparathyroidism may include lethargy, irritability, emotional lability, convulsions, cataracts, dental abnormalities, and calcification of basal ganglia and subcutaneous tissues. The treatment of hypoparathyroidism is relatively simple and can bring about profound clinical improvement.9 The aim of our study, therefore, was to investigate for hypoparathyroidism in a population of individuals outside the neonatal period known to have 22q11 deletion syndrome. Patients known to have the 22q11 microdeletion from FISH (fluorescent in situ hybridisation) studies were eligible for recruitment into the study. Patients with the 22q11 microdeletion were identified from registers held by the Institute of Medical Genetics, and the Paediatric Cardiology and Endocrine Services. Investigation consisted of a detailed clinical history enquiring into symptoms of hypocalcaemia, blood sampling for measurements of serum concentrations of calcium (normal range for children 2.20–2.70 mmol/l and adults 2.2–2.6 mmol/l respectively), albumin (normal range 35–50 g/l), parathyroid hormone (PTH, normal range 0.9–5.4 pmol/l), phosphate (normal adult range 0.8–1.45 mmol/l), magnesium, and alkaline phosphate and a urine sample for estimation of the calcium:creatinine ratio. Any patient not able to attend for blood testing had review of their notes and biochemistry results for evidence of previous abnormalities of calcium biochemistry. Ethical approval was obtained from the South Glamorgan local research ethics committee. Sixty one individuals were identified with 22q11 deletion syndrome, of whom 23 had no hospital records in our unit, were untraceable, or could not be contacted. One patient with psychiatric illness was unable to give informed consent. Biochemical evaluation was performed on 27 subjects, of whom four were already diagnosed with hypoparathyroidism. Ten subjects underwent review of their hospital notes only. Table 1 shows patient details. 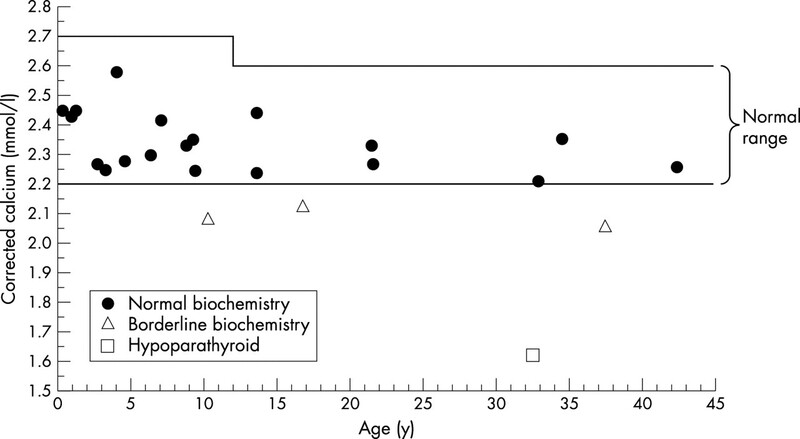 The children with previously identified hypoparathyroidism on treatment were aged 0.01–0.36 years at diagnosis. Three of these had persistence of neonatally diagnosed hypoparathyroidism. Figure 1 shows the corrected serum calcium concentrations of those other patients who underwent biochemical assessment. The patients with borderline biochemistry all had marginally reduced serum calcium concentrations in the absence of increased PTH and phosphate concentrations. Two members of this group had normal serum calcium concentrations on repeat blood tests. Relation between age and corrected serum calcium concentrations (normal range = mean ±2 SD, corrected calcium (mmol/l) = measured serum calcium (mmol/l) + ((40 − albumin (g/l)) × 0.02)) of subjects not previously known to have hypoparathyroidism who underwent biochemical screening. One patient in the normal group had a serum calcium concentration of 2.17 mmol/l, but with a slightly raised serum PTH concentration of 6.8 pmol/l and a serum phosphate concentration of 1.11 mmol/l, which did not suggest biochemical evidence of hypoparathyroidism. A further patient had a normal serum calcium concentration of 2.35 mmol/l, but with an undetectable serum PTH concentration and was assigned to the normal group in the absence of hypocalcaemia. Of those who underwent biochemical investigations a new case of hypoparathyroidism was identified. This subject was 32 years old, under follow up by the cardiologists for a ventricular septal defect and had not previously undergone measurement of serum calcium concentration. He had learning difficulties, but was otherwise asymptomatic. Trousseau’s sign could be elicited, but he had no others signs of hypocalcaemia. Biochemical investigations showed a serum calcium concentration of 1.62 mmol/l, phosphate 2.1 mmol/l, and PTH 1.3 pmol/l. He was subsequently treated with 1α-hydroxycholecalciferol. Symptoms of possible hypocalcaemia in those who underwent biochemical assessment (excluding those previously diagnosed with hypoparathyroidism) were recorded and are shown in table 2. No patients were receiving anticonvulsant treatment. In this population of patients with 22q11 deletion syndrome, 13% had biochemical evidence of reduced serum calcium concentrations. These subjects accounted for 30% of those who underwent biochemical investigations. Furthermore, it is of interest that the distribution of serum calcium concentrations in apparently normocalcaemic individuals tends to fall within the lower half of the normal range (fig 1). Reported symptoms of hypocalcaemia did not correlate with biochemical evidence of persisting hypocalcaemia. However, serum calcium concentrations were not measured at the time of symptoms. We have therefore shown that previously undiagnosed asymptomatic hypoparathyroidism occurs in patients with 22q11 deletion syndrome and conclude that serum biochemical screening of this population should be considered. Although patients with borderline biochemistry may represent normal individuals whose results fall more than two standard deviations below the mean, these subjects may be at increased risk of biochemically significant hypoparathyroidism and probably merit further monitoring of biochemistry in the future. Reported symptoms suggestive of hypocalcaemia and the urinary calcium creatinine ratio did not distinguish those with hypocalcaemia and would not be reliable screening methods. Our study is limited to patients who have largely received clinical follow up following their diagnosis of 22q11 deletion and who may therefore represent those who are clinically more severely affected by their gene deletion. The natural history of hypoparathyroidism in this syndrome is poorly understood given its variable clinical presentation. We suggest therefore, that prospective studies of children with 22q11 deletion syndrome are required to determine whether and how biochemical screening of this population for hypoparathyroidism should take place. In the meantime, we would suggest that children with 22q11 deletion syndrome should have their care coordinated by paediatricians with an interest in the condition. Patients with 22q11 deletion require a protocol for follow up to ensure that all aspects of the variable phenotype are assessed with referral to the appropriate specialist when required. With regard to the risks for developing hypoparathyroidism we would suggest that families with 22q11 syndrome are aware of the symptoms that might occur with hypocalcaemia. Serum calcium estimation should be considered at the time of diagnosis of 22q11, when symptoms of hypocalcaemia occur, prior to surgery, and during pregnancy. Finally genetic investigation for 22q11 microdeletion should be considered in patients with idiopathic hypoparathyroidism. Goodship J, Cross I, LiLing J, et al. A population study of chromosome 22q11 deletions in infancy. Arch Dis Child1998;79:348–51. Conley ME, Beckwith JB, Mancer JF, et al. The spectrum of the DiGeorge syndrome. J Pediatr1979;94:883–90. Shprintzen RJ, Goldberg RB, Lewin MI, et al. A new syndrome involving cleft palate, cardiac anomalies, typical facies, and learning disabilities: velo-cardio-facial syndrome. Cleft Palate J1978;15:56–62. Burn J, Takao A, Wilson D, et al. Conotruncal anomaly face syndrome is associated with a deletion within chromosome 22q11. J Med Genet1993;30:822–4. Cuneo BF, Langman CB, Ilbawi MN, et al. Latent hypoparathyroidism in children with conotruncal cardiac defects. Circulation1996;93:1702–8. Sykes KS, Bachrach LK, Siegel-Bartelt J, et al. Velocardiofacial syndrome presenting as hypocalcemia in early adolescence. Arch Pediatr Adolesc Med1997;151:745–7. Adachi M, Tachibana K, Masuno M, et al. Clinical characteristics of children with hypoparathyroidism due to 22q11.2 microdeletion. Eur J Pediatr1998;157:34–8. Alscher DM, Mettang T, Kuhlmann U. Cure of lifelong fatigue by calcium supplementation. Lancet2001;358:888.